I had a choice of two movies on the same day, when I saw Keeping Up with the Joneses at a screening last week, and apparently I chose poorly; Joneses provided light chuckles, at best, and even those were sporadic. Jeff Gaffney (Zach Galifianakis) and his wife Karen (Isla Fisher) are typical suburbanites, who love living in their Florida cul-de-sac. When their two boys go off to summer camp, they find themselves as empty nesters, temporarily, and so they're excited when a new couple moves in across the way: Natalie (Gal Gadot) and Tim Jones (Jon Hamm). They find themselves befriending the couple, but Karen is convinced that the couple is hiding a secret; it turns out she's right, and the two of them are government agents. Jeff and Karen soon find themselves tangled up in Tim and Natalie's world, and running for their lives. This movie had the potential to be so much better than it actually was. The plot was interesting, but as a comedy, the jokes kept flopping, at least for me. I did chuckle a few times - Tim brings Jeff to a "snake cafe" type thing, where they actually serve snakes, and understandably he freaks out, at one point saying "But they don't serve PANDA at PANDA Express ... right?!" which was funny. But overall, I was pretty disappointed throughout, especially with this A-list cast (Galifianakis, Fisher, Gadot, Hamm), though if the script is unfunny then it's not their fault. No, don't see this movie. My mom remarked that the film seemed a lot longer than it actually was (and it's only an hour and 40 minutes, so that's not a compliment ...), and I agree - I was constantly checking my watch throughout it. I just saw Galifianakis two weeks ago in Masterminds, and that film was a lot funnier than this one; if you're looking for a comedy to see in the theaters currently, I'd recommend that movie. 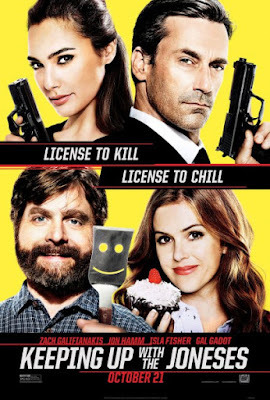 Also, the concept of the "Joneses" has been done already (2010's The Joneses) - a bit of a different concept, to be sure (in that film, they were sales people who were undercover, for the most part, not spies), but a much better movie nonetheless. Keeping Up with the Joneses is in theaters today, October 21st, and is rated PG-13 with a runtime of 101 minutes. 2 stars out of 5.